The playing, if not the singing, is seldom short of outstanding, and the work on one track, "Can't Seem To Make It Happen", is absolutely astounding - it still takes my breath away after 25 years. The Canadian group Jericho was formed in Toronto in 1970, with members Frank DiFelice, from Brantford, Ontario, on drums, Denny Gerrard on bass, lead guitarist and singer Fred Keeler from David Clayton Thomas' first group, the Shays, and keyboard/accordion player and singer Gordon Fleming. The cover photo shows, left to right, Gerrard, Fleming, DiFelice (sitting), and Keeler. Gord Fleming also worked with John Hammond, David Clayton Thomas, Jesse Winchester, Ian & Sylvia, Cat Stevens, and the wonderful Kate and Anna McGarrigle. He later stopped playing, and was working as an art restorer in Toronto when he died in February 1996. Gord and his twin brother Paul Fleming, a musician, lawyer, and artist (and a reader of this web site, see the guestbook for October '96), both played in Ronnie Hawkins' band after the breakup with Levon and the Hawks. 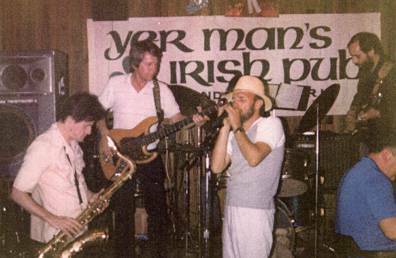 From left to right, Paul Fleming, Ken Kalmusky, Serge Daniloff, and John Till, on stage in Ontario, 1985. Kalmusky and Till played with Richard Manuel in the early Stratford, Ontario, band The Revols. Denny Gerrard, who played with many Canadian groups, including the Paupers, and also recorded with Richie Havens and Peter, Paul & Mary, is still playing in Toronto, in Mike McKenna and Slidewinder. At the time of Jericho, Gerrard was considered one of the rock world's best, his extended solo at Monterey with the Paupers is cited in a number of books as the first highlight of the festival. 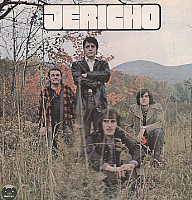 Jericho released their self-titled Bearsville album in 1971 and split soon after. They had one hit record with "Make It Better" in 1971, on Bearsville Records, distributed by Ampex Records in Canada and the United States. "Make It Better" and its flipside, "Cheater Man", were written by Fred Keeler. Produced by Todd Rundgren, the music on Jericho is really nice, strongly reminiscent of The Band circa Stage Fright (Rundgren also did production/mix work on Stage Fright. The cover design for both Jericho and Stage Fright was done by Bob Cato.) The extensive liner notes say: "The Story goes that Jericho came down to Shady from Toronto...They compliment The Band and talk strongly about Albert and BB King, Big Mama Thornton, Red Garland, Otis Redding....".) Some of the tracks really rock, some are ballads. All songs were composed by Keeler and/or Fleming, except a cover of Mose Allison's "Fool Killer". Garth Hudson is credited on the Jericho album, he did not play but was thanked for letting Gordon Fleming use his clavinette and Leslie organ speaker on the recording. Jericho - Jericho - 1971 - Bearsville 10112, distributed by Ampex.